I can’t tell you how happy I am that spring is here. It’s my favourite season of the year. So much potential and optimism and such a great time to make a fresh start with a shiny new recipe to add to your repertoire. 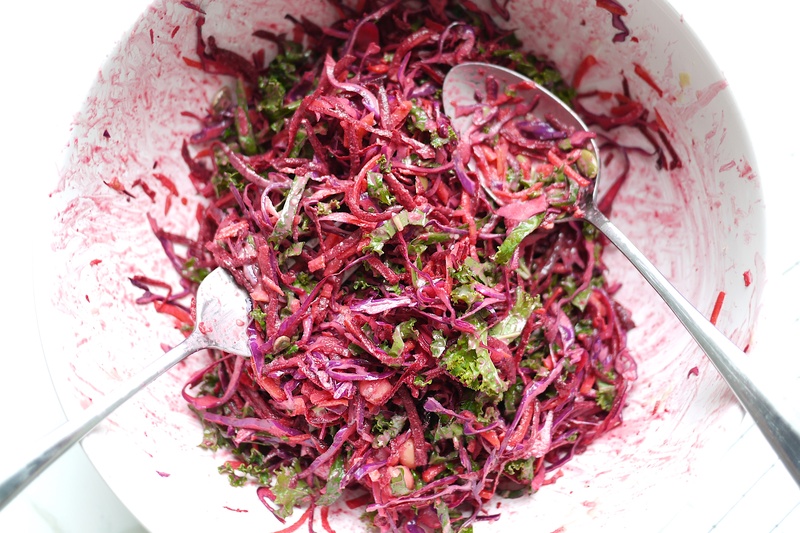 What better way to celebrate than with a colourful, fresh, happy looking little salad, right? 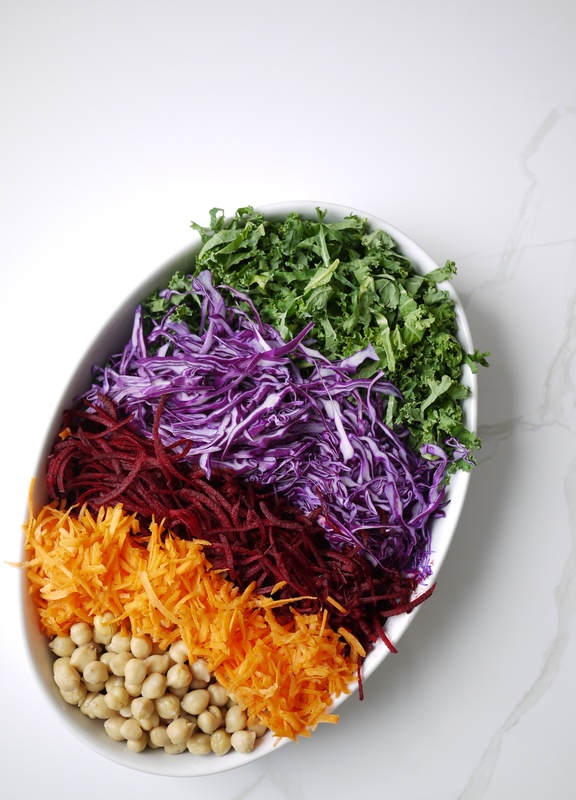 I put together a super-simple shredded salad to inspire our inner rainbows to come bursting through our bellies like a good Care Bear moment (sorry if you’re not obsessed with the 80s and miss the reference). This is one of the easiest and prettiest little salads ever. It’s a whole lot faster if you have a food processor with a shredding blade, but a good old hand grater and sharp knife will do the trick just fine. 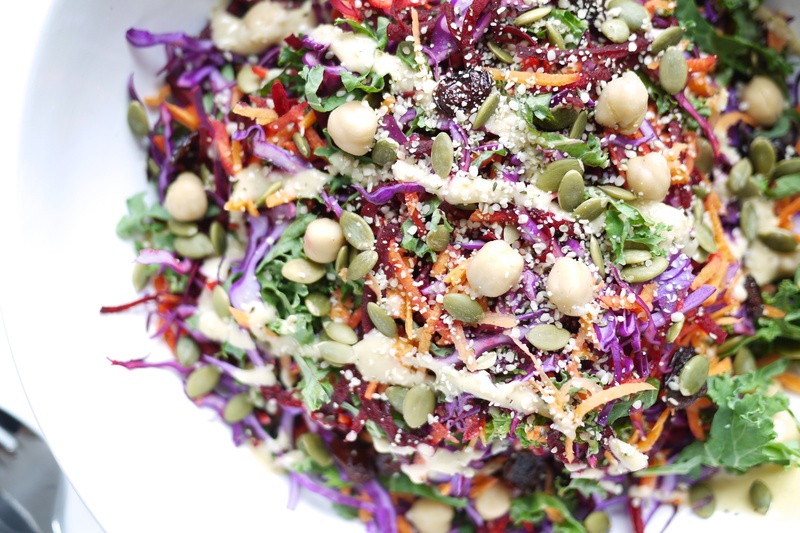 Obviously, there are so many reasons to fall madly in love with this salad besides how pretty it is. It’s PACKED with powerhouse nutrition from all those vibrant plant colours so you know you’re covering LOTS of bases in the phytonutrient department. Because it’s raw, you’ll also be getting a good dose of enzymes to help your digestive system out AND with a quick sprinkle of nuts or seeds, it’s got plenty of protein from the chickpeas and seeds so I can totally be the full meal deal if that’s what your belly desires. And, can you say fibre, fibre, fibre? The list could go on, but I’ll leave you with those beautifying benefits for now to help you connect with your inner spring groove. Plus, it’s a real crowd-pleaser and a visual stunner, so you’re sure to get brownie points for toting this along to any upcoming potluck parties. Plus, plus, plus…practically speaking, this salad holds up like a boss. It’s full of hearty veggies like cabbage, carrots, kale and beets, so your leftovers (if there are any) can last for days even AFTER it’s been dressed. This means you can make a big batch and keep going back to the fridge for instant salad gratification any time through the week when you might be short on time (yes, it turns pink when you toss it from the beautiful beet juices)! I always give leftovers a fresh squeeze of lemon or lime to make the flavours sing again. You can dress it with ANY of your favourite vinaigrettes or dressings, I think it goes insanely well with a simple Maple Lime Tahini drizzle and I’ve included the easy recipe below. Add all ingredients into a resealable glass container and shake vigorously until well combined and thickened. 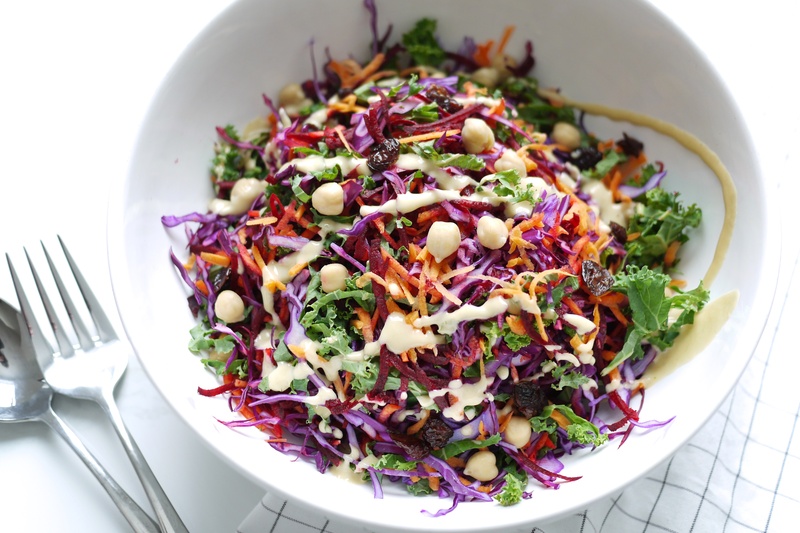 Add veggies and chickpeas in large bowl and toss with Maple Lime Tahini Dressing. Sprinkle on seeds and dried cranberries. 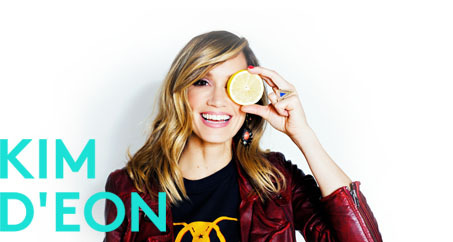 I’m super pumped to help celebrate the beginning of my favourite season by collaborating with a handful of other real foodie rockstars who have also posted up some of their favourite spring salad recipes to tempt your tastebuds and keep you glowing from the inside out. 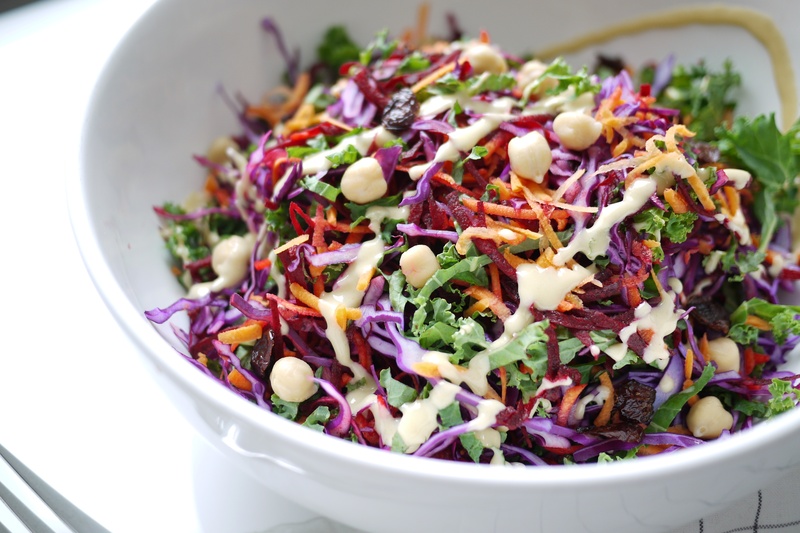 So, be sure to check out the rest of the Spring-Inspired Salads Recipe Bonanza! Get in on the action by posting up your own spring salad creations and be sure to tag me @kimdeoncom if you make mine so I can see your stuff!